Yeah, top melt is from June through July, bottom melt from mid- or late-July through mid-September (but peaking in August). Storms in August do tend to damage the ice quite a bit. The question now is how much of the remaining ice left in the CAB is thin enough to be completely destroyed by bottom melt alone??? A Lot; but far from all. However, what will be affected more than usual will be total volume. Smaller floes = increased surface to volume and increased (potentially significant) lateral melt. It is possible we could have higher SIE, and SIA, but lower volume than 2012. How's that for a mind boggle? Can someone clue me in on this 'deep water mixing' that everyone seems to think is going to happen? As far as I am aware, storms usually only disturb the top few metres of ocean. Wind-driven waves don't go particularly deep, especially if there is a cap of ice floes to absorb a lot of the wind energy. Why do people think the water will be mixed beyond, say, 5 metres? Storms (and even high-pressure weather systems) do, indeed mix ocean waters. But it's not because of waves. It's called "Ekman pumping" and it has to do with Coriolis forces and surface waters being pushed by wind. Low pressure systems cause sea ice to move away from the storm center (counter-intuitively, as one might expect ice to be drawn into lower pressure areas). Water moves the same way. Under high pressure, ice is drawn in to the center, just as ice is. When water/ice is pushed outwards from a storm, it's replaced at the surface by deeper waters. The water pushed has a tendency to push other water down. Thus, mixing. Put a low pressure system near a high pressure system, and the effects on motion of ice and water are additive (synergistic, perhaps). The precise physics of Ekman pumping and Coriolis forces are complicated. The net effects, for our purposes, are readily predictable, though. Any increased mixing makes a difference. Think how when you stir your drink, the ice cubes melt faster. The Ekman pumping action draws warmer, saltier water from depth. Both act to increase ice melt. This is ITP-57(ice tethered profiler). On the far right are today's profiles. The mixing is quite apparent. Thanks Vergent, that seems to really show how much the storm is getting in! The day markings are 15 days apart so it looks like there has been significant activity in the top 25-30m for the past 40 days or so but the changes in the last couple [as a resut of the storm we assume] have extended down as far as 400m!! That is further than I had imagined it would. IIRC from discussion about the 2012 storm, the speculation is that, since ice chunks are 7/8ths submerged, as the wind and waves blow the top half, the lower half acts to churn the water much more deeply than would happen in a storm without ice chunks floating around in it (and the ice seems to all be in chunks and floes up there now). Also ice can have deep 'keels'. If you have a meter above sea level then you have an average of 9 meters or so below sea level. However the bottom of a floe isn't necessarily even. Some parts are less than this 9 meters deep, others more so. If one is looking at a floe 'bobbing' on the ocean, sweeping through an angle of X, the deepest keels are also sweeping through that angle, mixing things up. I've had a quick look on t'internet and found some interesting (if pretty mathematical) stuff on this. It will be interesting to see what effect this has on the arctic ice in the next few days. Will it be enough to eat all the way through the mostly FYI, or will enough survive to keep the ice area relatively unchanged? I was the one who suggested that highly fractured, "slushified" ice is a positive feedback--not directly on arctic warming, but on mixing of surface waters with deeper, warmer, saltier waters. The old thick, solid sheets of arctic ice used to shield arctic waters from mixing by storms. Open water without ice probably doesn't mix as easily as slush under the effects of wind. Broken ice, however, will present a bit of a "sail" above the water line, and great cross-section below, to better push water. The temp/salinity buoys are showing mixing now near the storm, with some of the warmest water at around 200 - 400 m involved in the mixing. This effect has the potential to extend the bottom melt season. In those peripheral areas where surface waters are quite warm, some of that warm water will be mixed with deeper waters, presenting a store of heat that may persist through the coming winter, potentially helping to accelerate spring melt in 2014. Well the next profile is in and yesterday's mixing has disappeared! I guess the water was unmixed during the night. The mixing effect from GAC-2012 left lasting fingerprints on the ice. If you look at CT area anomaly, it took a big dive around the time of the storm and continued falling through the 2012 minimum. This year we would expect to see a similar drop in the anomaly trace for the next few weeks, though not as sharp or deep. On the neighboring thread, BFTV tells us that MASIE has a record loss for yesterday...194.7k. So are we starting to see the real effects of the storm, finally? Has anyone been watching those meters for temperature and salinity at depth for a while? Do they often make adjustments of recent readings? I wonder if someone looked at that reading and thought that it just must be instrument error. If you look at the text data files it seems profiles 673-676 were largely incomplete. Maybe some sort of interpolation was being attempted on the plots, which works much better now another complete set of readings has been obtained? There has been surface warming at whoi buoy's 57, 58, 62 and 64 for awhile now but in all cases there has also been surface freshening. If there were deep mixing the surface waters with deep water it should result in an increase in surface salinity. Just to be clear, the MASIE drop yesterday isn't a record fall. Infact, in the last month has seen 4 larger daily drops than yesterday, all of which were over 200k, the last being 220k just 3 days ago. We'll have to watch the next few days to see if the large losses can be sustained. MASIE had 4 consecutive >200k drops at the end of last August, so there's a target to look out for! What will the weather in the Arctic be doing for the next 5-10 days? Can we expect it to be conducive to further melting?? ITP 47 may be showing the effects. I posted this on another forum earlier today, and having looked at this evening's ECM and GFS outputs, I think there's no need to change it. The current pattern and how it effects the extent drops over the next few days will be important to watch. The large area drops from the storm damage should begin to appear tomorrow on CT, with a fall of over 100k likely. After that, a strong cross polar flow is forecast on the ECM and GFS, with strong winds from the Laptev/East Siberian Sea across to the Canadian Archipelago and Greenland. As there is a lot of quite low concentration ice right across the central Arctic, we could see a large amount of compaction and ridging from this flow, which may maintain high extent losses for the 5 days. All the while, warm air looks like remaining over the Beaufort Sea and the Canadian Archipelago for the next few days, causing increased melt in these areas. I should add to that, the the water profile data was based on yesterdays info, with thing a little more subdued today. Going region to region 2013 just doesn't look very different than 2012 except that some regions were delayed a bit. A couple melted a bit quicker and the Greenland is already lower than 2012's minimum. The Beaufort, Siberian, Laptev and Kara look like they have plenty of time to reach ~zero. It doesn't look like the extra ice in the 'slow to start' areas has slowed CAB melting. It's been slightly ahead of 2012 part of the time, up to the recent 'plateau'. Then take a look at today's Bremen. There's a huge streak of lower concentration flowing right through the middle of the remaining ice. This looks like large portions of the ice could be separated and left to melt. It looks to me as if we could have some interesting times before the fat lady sings. Oh, and the fast ice along the east side of Greenland seems to be doing a disappearing act. There could be a wide open melting ground outside the Fram. What will it look like afterwards?! I guess it'll look quite blue. In Bremen's colors, that is. Since the recent cyclone has caused a divergence of the sea ice, pushing ice into the Beaufort and Chukchi, could we actually see a stall in the reduction of SIA in the Beaufort? It is already significantly behind 2012. Could some of this ice survive the melt season? It certainly does look possible that a large amount of ice on the Eurasian side could separate from the bulk of ice in the CAB. Does this separation necessarily mean that all of this ice will melt? Could some of it survive the melt season even if it has separated, particularly the large pack of 90% concentration closest to the pole? Didn't the end of the 2007 melt season include a tongue of ice extending into the CAB at the same location as this pack of 90% concentration? "Green, green, it's green they say on the far side of the CAB"
More than probably anyone else here, I'm operating mainly by guessing. Just looking at what has happened and trying to guess a range of possible outcomes. If a large hunk of ice gets pushed from the CAB to the Beaufort I would expect it would melt faster there than as part of the main pack. And it would subtract from the CAB total. I can't see a breakup in the main pack into separate zones of ice as doing anything but increasing melt rates. I see a lot of people concerned over the Atlantic side of the CAB, but isn't this area regularly flushed by the transpolar drift? I would think that in terms of lasting value to the pack, MYI formed within the Beaufort gyre would be a whole lot more important than ice that lasts maybe a year or so before exiting out the Fram. What happens when that ice is gone? You are far from alone, sir. Looking at Bremen and doing "thumbnail" calculations, I see about 25% of 80N and above as open water - average concentration no more than that. Has that ever been seen before? Large areas on the Siberian side are worse. What I can see from Lance Modis suggests the slush is melting out, just leaving disconnected floes. And that stubborn chunk of Kara is very much breaking up. We may not beat a record, but the ice is beat to hell. I see little opportunity for much ridging, thus a lot of mixed ice... MYI above, FYI below. What will the dynamics of *that* be?! Isn't the Arctic also experiencing a lot of (heat-trapping) cloud cover? I'm not predicting a new record. I think that a fairly low probability event, but it's not feeling like a 5th, 7th place finish. At the minimum some new things to see between now and when freezing resumes. looking at the hycom ice drift predictions, my heart is breaking as it looks like the prevailing winds are going to be working over the next 5 days to open up the center of the ice pack. I hope I am wrong. From Uni Hamburgs ASI SSMIS ice concentration data, this comparison with same-day-2012. - how typical is this in terms of last ~5 years, though? Anybody knows? I really have a bad feeling about it. Also, i recon it's about the surface temps; how deep this anomalous heat in open-water areas may go, though? ~50 meters on shelves? More? A major loss reported on DMI, not sure if it's a cliff or it's foretelling some further losses to come. Bug, there's a swath missing from the latest data file. Thanks for the link, but it is so easy to post. While it may be true that the current data is flawed, it may also be true that the past data is flawed. Unthinking robotic models, and data products, are no substitute for reasoned observation. Eh? I'm not saying anything about the overall data being flawed. I'm saying that the single last point on the graph is based on incomplete data, because there's a swath missing (and the deficit is visible on the map). This happens all the time with these near-real-time products - NSIDC, DMI and IJIS alike - and is always fixed within a day or two when the missing swath comes in. It has nothing whatsoever to do with modelling, it's just a missing observation or two! Significantly large areas being some +8 degrees C anomaly - how typical is this in terms of last ~5 years, though? Anybody knows? I really have a bad feeling about it. Also, i recon it's about the surface temps; how deep this anomalous heat in open-water areas may go, though? ~50 meters on shelves? More? Last year there was a fairly large area of the Beaufort Sea which had >10C anomalies, so it has not warmed up as much as it did last year. Quite something when such warm anomalies can be considered to constitute a relatively "cool" year, though. I don't think this is all that obvious. In my extent/area calculation, if data is partially missing it will use the data of the previous date or the date before that. That has proved sufficient in all cases until so far. I thought this was so obvious that I did not even list that as one of the "features" of my calculation. It was just in there from day 1. So, in my professional opinion, this is a serious shortcoming, very easy to correct. Number "-9999" represents that we couldn't conduct the observation during the period for the reason that the satellite went into constrained operation mode or stand-by mode to avoid harmful effects by meteor showers and solar flares. The sattelite might have been put in a defensive mode due to the meteor shower. Was thinking same thing, too. Went on to see a few regional maps in locations of large rivers entering the ocean - those places have SSTs for thousands square kilometers of the ocean being some 18...20 degrees C. Looking back at the one i posted here with my previous message, i see that some most anomalously hot regions are indeed ones where big rivers come in. And then i see two large and rather red anomalously warm regions near Greenland. What is it? Greenland melt waters? If yes, and if to assume that the temperature of melt waters there should be much lower than temperature of rivers going into Arctic ocean from continents, - for a simple reason that rivers go largely through now ice-free areas for hundreds of kilometers, being warmed up by the sun - while Greenland melt waters are going through/under ice and thus are being kept rather close to freezing point - then, with such an assumption, some wild guess about the volume of melt waters there - is really scary. That is, if melt waters are indeed near freezing point temperature, then it must be extremely very huge volume of melt waters to produce those large anomalously warm regions near Greenland. Last 2 years, it's a sea level rise of some 10-11mm every year; could it be that Greenland is indeed dropping much more - possibly, times more, - meltwater every year in compare to what it was just some 3+ years ago? Could it be happening because Greenland's under-ice lake-like reservoirs of liquid water are now "full", while until some ~3 years ago they still were not, and much of melt water was not dropped into the ocean, but was still filling up those land-based "lakes" in Greenland itself (under ice)? This would be something which never happened before (last couple thousands years at least, i guess); just like ~10mm/year sea level rise - which, obviously from the graph, never happened before (in recent past) for 2 consequetive years. The rate of sea level rise in the past couple of years is higher that it would normally be due to a rebound from floods in Brazil and Australia that actually caused a fall in sea level in 2010-2011 (http://www.jpl.nasa.gov/news/news.php?release=2011-262. The warm water around green land comes from the gulf stream afaik, not from the ice sheet itself. Thanks for links, man, i'll read thouroughly to learn as much as i can. I doubt very much that surface temperature anomalies currently in place near Greenland are from Gulfstream - especially the one west from Greenland, - because the form of anomalies themselves (i mean, look at those concentric half-circles of lower and lower temperature anomaly around relatively small chunks of Greenland coast) - is very suggestive of a relatively small, point-like sources of warm water right at the shore of Greenland. One near the west coast of Greenland is located at such a place where Greenland shore comes nearly strictly from south to North, too. So you see, it is hard for me to imagine how exactly Gulfstream would 1st get deep enough not to influence (any much) surface temperatures to the south of said SST anomalies, then, 2nd, travel deep underwater, as a warm current, northward for thousands of miles along _both_ east and west coasts of Greenland, then 3rd - re-surface in relatively small areas, despite having still much more open water to the north (in general), and 4th, to do all that while still being substantially warm. ...could it be that Greenland is indeed dropping much more - possibly, times more, - meltwater every year in compare to what it was just some 3+ years ago? If this were happening I would expect it to have been picked up by the GRACE satellites. 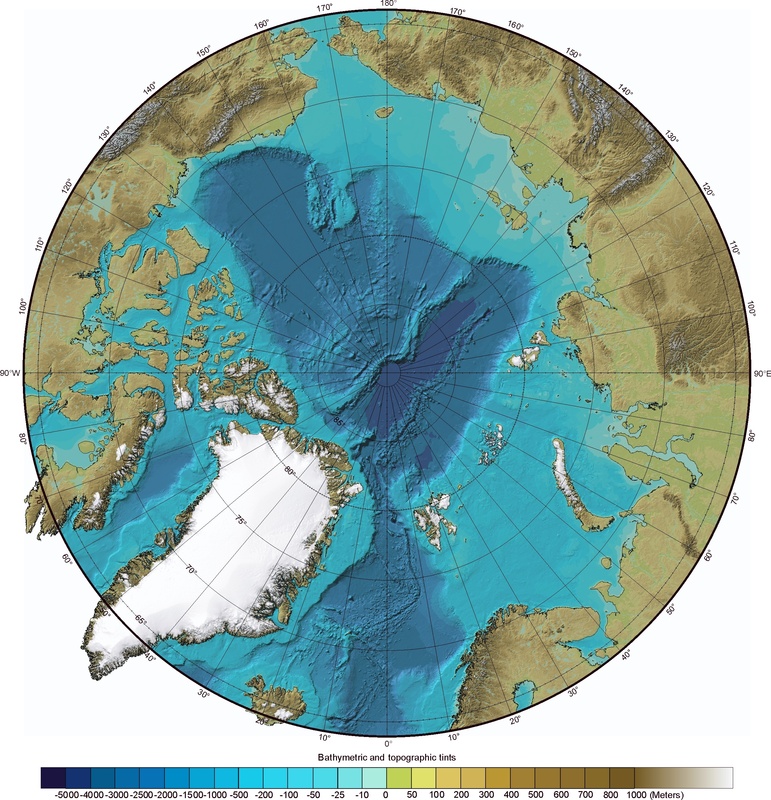 As to the SSTs to the West of Greenland, I can find a map of the sea level depths here - http://geology.com/world/arctic-ocean-bathymetry-map.jpg - which shows that the seas there are relatively shallow. I think the warm SSTs there are just a result of early sea-ice melt allowing the shallow seas to warm in the sunshine, just as in the Barentsz sea. I haven't been watching ice melt for all that long, but that seems to me like a fairly decent change in the state of the ice. Those polynyas are not new. They had made an appearance earlier in the melting season, but they did not get this wide or reached this far across before. The reason this is interesting to me is because I can't find anything in terms of air pressure or temperature to justify this much movement is such a short period of time. Of course, it's possible I'm just missing something, like wind and ocean water temperatures.